UAV technology is rapidly changing the way that fire departments around the globe are waging battle against fires. Fighting house fires, multi-alarm blazes in congested urban areas, and wildfires all require different strategies –– but drones used for firefighting are increasingly popular regardless of the situation. There are so many benefits for fire departments using drones, not the least of which is the fact that they are unmanned; a drone can fly into areas without risking the safety of a helicopter pilot while also conserving expensive fuel and drastically lowering the stakes of conducting an investigative flight. Once a camera-equipped drone is in the air, it is capable of collecting vast amounts of information that fire teams can use to better understand the fire they are up against. Read on to learn about three of the UAV camera features your fire department should be taking advantage of today. Drone cameras can now be equipped with thermal imaging. 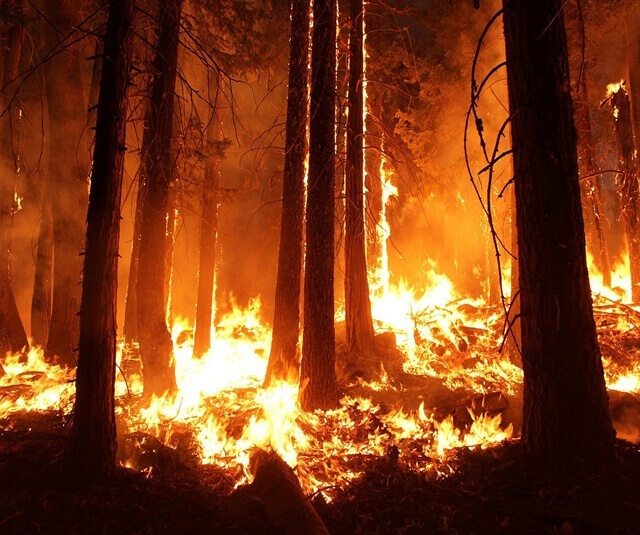 This technology can detect variations in thermal radiation which can provide a clearer picture of the intensity of the fire and help determine its origin and its trajectory. Thermal imaging can also detect the heat given off by people, animals, electrical circuits and power lines, liquid and gas lines, industrial machines, and more. Not only can this help search and rescue teams locate stranded people, but it can also help them identify potentially dangerous areas so teams know to steer clear in the event of an explosion. Infrared Illuminated cameras project a beam of near-infrared energy that their imager can see when it bounces off an object. This creates an image that is similar to the “greenish” night vision camera that you’ve undoubtedly seen before. This technology offers an affordable and reliable solution for reading heat signatures in low-visibility situations, including smoke, dust, fog, and rain. While it may not be quite as effective as thermal imaging, it nevertheless allows for detecting various heat signatures in firefighting scenarios. High definition video from drone-mounted cameras is key to modern firefighting. UAVs equipped with high-quality cameras can transmit encrypted 4K video, in real time. This allows fire teams to clearly survey areas – critical in combating wildfires across a wide swath of landscape. This video can now be transmitted directly to the pilots and observers who remain in a safe location, yet can respond in real time to what they are seeing from the sky. As a Veteran owned company, Homeland Surveillance & Electronics (HSE) is proud to be a leader in supplying remotely piloted aerial drones used for firefighting and first responders. Our UAV solutions include innovative camera features and software that can help keep teams safe and perform their duties more effectively. Our drones are manufactured for durability, quick deployment, and ease of use and can withstand extreme weather conditions. In addition to our state-of-the-art camera technology, our firefighter drones offer power cell technology that delivers great flight times, extreme adaptability, stability in bad weather, and reliability. If you’re interested in sourcing drones for your fire department, or need pilot training or consulting about any necessary FAA certifications, simply give us a call at 309-361-7656. We look forward to getting your department the drone technology you need.